Going after turkeys this spring? This four-part series is your guide to harvesting the four wild turkey subspecies. Part II: hunting Rio Grande turkeys. Looking to make your Grand Slam Turkey run this spring, or just to add a new species to the list? I’ve been chasing wild turkeys across the country for over a decade with archery tackle, and during that time I’ve adapted a system for each particular subspecies that has proven effective time and time again. Over the next four weeks I will be reviewing some surefire recipes for success for each of the four turkey subspecies recognized by the National Wild Turkey Federation. 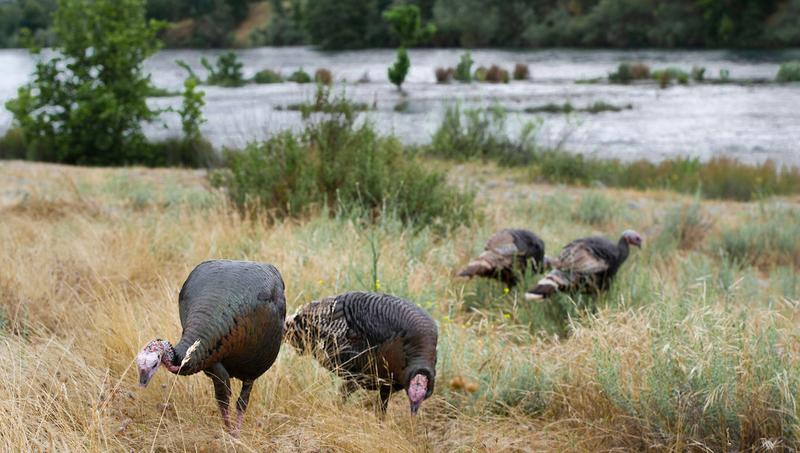 Of the 49 states that allow turkey hunting, the Rio Grande subspecies is found in 14 of them. Texas, due to its massive size, management model and ideal habitat, leads the charge when it comes to overall population of these butterballs. Other notable Rio states include Kansas, Oklahoma, Nebraska (you will find some hybrids) and South Dakota. Nationwide, the population of the Rio subspecies is well over 1,000,000 birds strong. Named after the famous Rio Grande River, the Rio Grande subspecies, like the Merriam’s, is a nomadic, opportunistic feeder. Multiple studies have been conducted that prove Rios will wander more than 10 miles from their winter feeding grounds to their spring breeding grounds. Highly adaptable to an array of climates, the Rio often prefers to roost in the tallest tree it can find, and if that tree happens to be along a brush-choked creek, all the better. While Rios can and do thrive in a number of pine forests, the bird prefers mesquite, scrub oak and basically any brush along a creek or river system. Not nearly as dark as its Merriam’s cousin, the Rio has longer legs, and its most distinguishing color is a coppery hue. The tail fan showcases yellowish-tan tips that are much lighter than the Osceola or Eastern but darker than the Merriam’s. On average, hens tip the scales between 8 and 13 pounds, and a mature tom will have a fighting weight around 20 pounds. I’ve successfully hunted Rios in Colorado, Kansas, Nebraska, Oklahoma and Texas, and the key ingredient to being a Rio killer is having a solid pre-hunt plan. Rios are creatures of habit, and if left undisturbed they will often hit the same roost and strutting areas day after day. Do your homework ahead of time, locate the birds, note their travel patterns and make a game plan. Note: Just make sure that when you set this breeding duo up, you leave room between the jake and hen for the approaching tom to walk between. I’ve found the toms like to walk between the jake and hen in an effort to show dominance and go face-to-face with the jake. When running and gunning, few things, in my opinion, work better than the Strutting Turkey Decoy from Heads Up Decoy. As mentioned in Part I of this series, the decoy will attach to the bow, but it can also be run off a stake-mounting system. Personally, I like to run this decoy mounted to the bow, as that allows me to basically spot-and-stalk Rio gobblers. When using the decoy, I like to slip within 150 yards of the bird(s) and simply try to show the birds just the top half of the fan. Inching the fan just above a cactus or other small bush seems to work well. If the birds take note and start coming, don’t call and don’t move unless they hang up. If the birds don’t take immediate note of the decoy, give them a few yelps. If a bird hangs up or simply doesn’t start in your direction, don’t be afraid to crawl toward him. More than once I’ve crawled right at a reluctant tom and had the bird do an about-face and come at me on a run. It’s my opinion that Rios are the most vocal of all the turkey subspecies, which makes calling to these birds an absolute riot. I use the same calling system mentioned in Part I of this series. The only adjustment I make when calling Rios is to incorporate a slate pot-and-peg call. The soft slate surface is highly versatile. How you rough-up (sand) the call and the type of striker you use (purple heart wood is my favorite) will determine pitch. It seems that the deeper tone produced by a purple heart striker really appeals to Rio gobblers. In the spring of 2017, I arrived for a DIY Rio hunt on a buddy’s ranch in Texas. The ranch had never been hunted for birds, and this was to be my friend’s inaugural spring turkey adventure. The good news was the ranch was loaded with birds. The bad news was that two months prior to our hunt a severe wildfire raged across the ranch and left it charred. There were still plenty of roost trees, and, due to the new growth and hatching bug life, birds were numerous. The issue was cover. We could easily glass and spot birds from long distances, but they could spot us as well. I arrived at the ranch with plenty of daylight left to hunt but opted to heed the advice given at the beginning of this article and do my homework. I spent the afternoon and evening hours driving the ranch roads, gaining vantage points and glassing. Thanks to regular ranch traffic, the birds tolerated vehicles more than a two-legged figure roaming about. With light waning, I located three birds moving toward a trio of large cottonwoods at the base of a small pond. I exited the truck, climbed a hill and set up my Nikon spotting scope. A pair of gobblers were tailing a hen. Upon reaching a small hill adjacent to the trees, they flew up for the evening. Having never been to the area before, I snapped some pictures of the landscape on my iPhone, pulled up an aerial map of the area on my device and dropped a pin on the location I planned to put my blind. Knowing how open the landscape was, I toted my decoys, blind and other gear into the area well before the break of day. I wanted to set up in total darkness and knew even a small sliver of light would tip the birds off to my presence. Using my phone and the pin I’d dropped on the mapping system, I made my way to the area I wanted to pop up my blind. Under the cover of darkness, I was able to set up my blind and decoys without ever alerting the birds. Note: I see more hunts blown because guys and gals try to get too close to a roost or simply don’t get into the woods and set up early enough. Like all game animals, the life of a turkey revolves around survival. They are under the constant threat of coyotes and bobcats, and they don’t miss much when it comes to something pressing in on their sleeping area. If you have birds roosted and know where they want to be shortly after flydown, be in that area. There is no need to creep 50 yards from the roost and risk blowing the entire hunt. Trust your scouting, calling and decoys. I have way more success hunting roosted birds when I’m at least 150 to 200 yards off the roost. As light broke, the pair of toms got extremely vocal. They would face the hen and gobble their heads off. The live hen actually turned away from the toms and never showed a bit of interest. She didn’t let out so much as a whisper of a tree yelp. The toms were excited, and though I don’t typically call much until birds get on the ground (other than a few soft tree yelps), I opted to get very vocal. Successful calling oftentimes comes down to one’s ability to match the mood of the boy birds in the area. Watching the birds through my binos, I noticed the boisterous duo did an about-face the second I let out a series of yelps. They could see the decoys, and when they did, they got even more excited. As light filled the landscape, I continued to match the intensity of the birds. I wanted to let them know that there was a willing hen and remind them that the lady they had in close quarters was ignoring them. It worked. The roosted hen exited the towering cottonwood one way, and the pair of two-year-olds the other. It was obvious they were locked on to my decoys and there was no reason to call again. The birds came in quickly and started abusing my jake decoy badly. I shot the first. The second tom, unaware of what had happened to his buddy, jumped on top of the jake decoy, giving me plenty of time to load a second arrow and dump the bird as he dug his spurs into the imposter. It was awesome. Note: I get asked a lot about how much a person should call. My answer is always the same: let the attitude of the bird(s) you’re hunting dictate how much you call. On this particular hunt, the birds were red hot. The hen in the tree with them was not. It’s difficult to compete with a live hen, even one that isn’t showing much interest. Because the birds were so vocal and because I wanted to draw them away from the live hen, I opted to get aggressive. I started with some soft tree yelps and then switched to more aggressive yelps and cuts. Always pay attention to how the birds you’re hunting are acting. I also believe that if there is one piece of equipment turkey hunters overlook, it’s optics. Optics play a huge role in turkey hunting. They are pivotal for scouting, and I like to use them to watch birds from my ground blind. Countless times I’ve spotted lone toms slipping in silently, and in this case, I was able to watch the body language of the birds in the trees. I could see them face my positon and gobble, which gave me an advantage. After wrapping things up in Texas, I headed to western Oklahoma to hunt with my good buddy and owner of Croton Creek Guest Ranch, Scott Sanderford. Scott was making his Grand Slam run, so I was behind the camera that first morning. The setup was classic. We backed the Double Bull into a thick stand of cedars and placed the decoys on the edge of a small wheat field. Remember that part earlier in the article about doing your homework and being where the birds want to be? Well, this hunt is a shining example of how important that tip is. The birds we were hunting were roosted more than a mile away, but Scott had been watching them for weeks. Shortly after flydown, the hens would begin their slow, steady march toward the wheat and the toms would follow. I could see the birds through my spotting scope — small black blobs crammed into a series of cottonwoods. I watched a number of longbeards strut on the limbs and even toss their necks forward and gobble, but because of the wind and the distance between us, I couldn’t hear a thing. Because we knew where the birds wanted to be and because there were so many live hens in the trees, we opted not to call. We felt we had the perfect setup and were going to trust it. About an hour after flydown, a tom and a passel of hens entered the field. As soon as he saw our decoys, the tom headed straight for the jake, and Scott’s arrow was true. Knowing how many birds were in the area, I opted to quickly dart out, get the downed tom and jump back in the blind. Scott and I switched places. Just about the time he got the camera rolling, a handful of jakes came sprinting in. I love jakes, and I believe any boy bird with a bow is a trophy. I think you can guess what happened next. Enjoy getting after those Rios and keep me posted on how your hunts are going this spring by dropping me a line at jace.bauserman@grandviewoutdoors.com.